R.C. Smith/MMI’s form-meets-function design philosophy facilitates efficient, regulatory compliant, and functional pharmacy work areas. With over 7,500 completed projects, the R.C. Smith/MMI design team draw from their experience of designing and installing modular pharmacy casework and apply that knowledge utilizing a collaborative approach to ensure the best solution and experience for each pharmacy environment. Because one design format will not meet the needs of every pharmacy, a wide assortment of casework products, specifically engineered to meet the demands of each facility, are available. The design team utilizes software that illustrates the finished pharmacy before construction begins and has extensive experience to meet the needs of facilities of any size. Moreover, site visits can be arranged to allow clients to see finished designs and receive input from colleagues who have been through the pharmacy renovation process. The Grifols Misterium suite of solutions provides safety and compliance for central and satellite pharmacies, 503B pharmacies, and investigational drug service operations. With a comprehensive approach to facility design, engineering controls, environmental monitoring, and equipment installation, Misterium materials and accessories are suitable for use in positive or negative pressure environments. Grifols offers consulting related to facility assessment, design consultation, and workflow analysis; cleanroom air balance compliance; and gap analysis and review of pharmacy operations. Engineering guidance and support, assistance with structural calculations, and development of drawings for Office of Statewide Health Planning and Development (OSHPD) submissions are also available. The WorkingBuildings Cleanroom Design and Consulting Team comprises expert engineers and pharmacists with extensive experience and knowledge of regulatory standards, such as USP <797> and USP <800>, for both 503A pharmacies and 503B compounding facilities. Services include new facility construction, design review, expansion planning, and remedial design solutions. Guidance on facility design and infrastructure is provided throughout the cleanroom design, construction, commissioning, qualification, and start-up phases. A range of approaches for planning temporary or modular cleanroom facilities during construction ensures that compounding operations and patient safety are not compromised. Construction is closely monitored to ensure quality and particle control for the duration of the project, and ongoing support and trending analysis for environmental monitoring are provided. 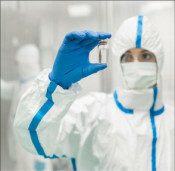 The Aluminum Bio-Clean line from Modular Cleanrooms provides USP <797> and USP <800> compliant particle infiltration and microbial contamination protection. The Aluminum Bio-Clean is a semi-rigid, modular cleanroom that can be fully customized and utilized as a free-standing cleanroom, or it can be retro-fitted to the facility’s existing space. The cleanroom complies with all buffer/anteroom requirements for sterile compounding, including the Integrated Vertical Laminar Flow Zone. 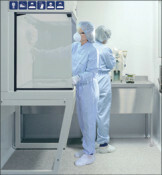 With more than 40 years of experience, Modular Cleanrooms features a staff of knowledgeable cleanroom experts.